The Green Bay Packers come into the season with significant depth at Quarterback, but would a good preseason be enough for them to get significant trade value for Brett Hundley? After falling to the 5th round of the 2015 NFL Draft, Hundley had a very solid rookie camp and preseason. Injuries limited his availability in the 2016 preseason, but trade rumors during the 2017 draft indicate he still has value in the eyes of other GMs. The Packers will need Hundley to continue to develop. For a team with Super Bowl ambitions, having a capable backup QB in place is a necessity. He should get a majority of the snaps in the preseason. Any reps Hundley gets in the regular season are a bonus, and are additional chances to prove his worth to potential suitors (Hopefully, due to the Packers blowing out their opponent and not an injury). Matt Flynn turned two solid games against the Lions and Patriots, and one great game against the Lions into a huge free agent contract from the Seahawks. NFL teams are desperate to acquire a franchise signal caller, and don’t typically follow a conservative approach in acquiring one. Examples of backup QBs trades include former Packer Matt Hasselbeck. He was dealt to the Seahawks with the 17th pick for the 10th pick and a 3rd rounder. Matt Schaub was traded by the Falcons to the Texans for two 2nd round picks. Kevin Kolb was dealt to the Cardinals from the Eagles for Dominique Rodgers-Cromartie and a 2nd round pick. The absurd demands the Patriots were reportedly making for Jimmy Garoppolo this offseason are indicators of what a backup with starting potential can demand. If Hundley lives up to his promise the Packers could expect a big return before the 2018 draft. The one thing working against Green Bay is the glut of QBs expected to be available next offseason. Garoppolo, Drew Brees, Kirk Cousins, Matthew Stafford, and Sam Bradford are all entering contract years (though at least a few of them will be resigned). 2018 also looks to be a promising draft for QBs with Sam Darnold (USC), Josh Rosen (UCLA), and Josh Allen (Wyoming) all expected to go in the top 5. While highly unlikely, there is also the possibility of a team trading for Hundley in the 2017 preseason. The Packers would have to be certain Joe Callahan was ready to be the backup, and they would have to receive a big return. Teams are usually reluctant to acquire a starting QB with only a few weeks to learn the playbook, but the Vikings laid a blueprint with their trade for Sam Bradford. If a contender loses their signal caller during Training Camp, they may be calling Ted Thompson. 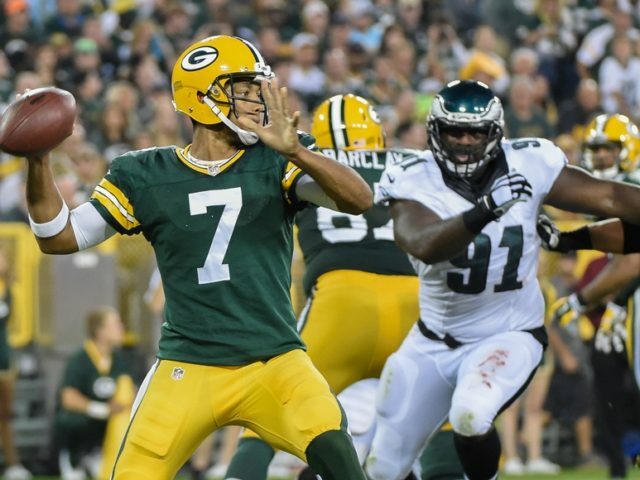 Brett Hundley will be one of the key players to watch this preseason. He will get a ton of reps and have the chance to show the reason the Packers have had such great faith in him, as well as demonstrate his value as a starting Quarterback in the NFL. Whether he is a trade chip or an insurance policy for Aaron Rodgers, Hundley’s development will play a critical role for the Packers moving forward. This entry was posted in Andrew Mertig, Packers 2017-2018 Season and tagged Brett Hundley, Green Bay Packers, quarterback, Trade Value. Bookmark the permalink. I think he has shown some potential and could fetch a 4th this year. If he has a notable preseason, perhaps a 3rd. If he were better at reading defenses and had better accuracy, it would be a 3rd and perhaps a 2nd if he lit it up during the preseason. In my fantasy football league (the one entirely in my head), TT calls the Jets or the Browns and offers them the tag team of Hundley and Janis. They work well together, Hundley is clearly more confident when Janis is on the field and Janis cannot have the career he could have in GB. Joe Callahan will be ready if he is needed but he will not be.